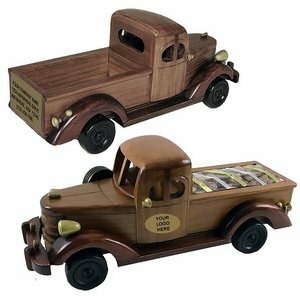 Wooden Pick Up Truck with Jumbo Cashews. Price includes (1) laser engraved plate on side of pick up truck. Additional laser engraved plates add $4.00. Imprint area: 4-1/4in W x 7/8in H - side plate on pick up. Price includes an individual mailing box. Each wooden collectible is hand-made, so no two are identical.